Stay healthy and save money at the samje time when you take advantage of the great savings available on a wide range of Vitamins, Supplements, Wellbeing products and much more. Where do I use my Boots voucher code? Shop as normal and add your products to your basket. Click ‘View Basket & Checkout’. Your discounts will be automatically added, click ‘Checkout’ to continue with your order. "To keep up to date with the latest news, deals and sales download the Boots App." 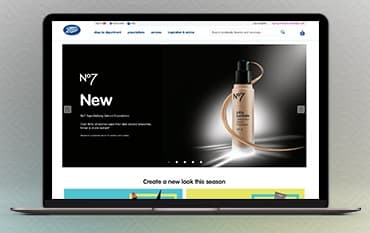 There’s little reason not to shop at Boots Online as you can collect in store for free on orders over £20 and receive free delivery on orders over £45, and all the while add up your Advantage Points to knock a little something off your bill the next time you shop. Of course, we’re here to do what we can to push the final cost down as low as it can go. We’ll show you all the best deals Boots are offering, we’ll pass you the voucher codes that'll strike percentages off your total and we’ll tell you when the big sales are on - we’ll do everything short of buying it for you. Boots don’t limit themselves to being one of the nation’s best-known, well-beloved high-street chemists. With a range that goes way beyond the pharmacy counter, their online shopping service lets you browse through their varied seasonal ranges, their expansive mother & baby range, their photo department, electrical goods and appliances, assorted toiletries and designer fragrances. You can also purchase accessories and make bookings for the Boots opticians. With the Boots sale, you can save money across all of these ranges with offers a variety of products including 3 for 2 on perfume, half price kids clothing, 1/3 of star gifts and much, much more. Boots beauty range is very impressive and expansive, with everything ranging from high street to premium makeup brands, with ranges for your face, body, hair, skin, teeth and everything else you can think of! With Boots beauty, you can shop from big names such as No7, Clinique, Chanel, Estee Lauder, Dior, Benefit, YSL, Max Factor, Rimmel, Soap and Glory and much more! You can buy beauty products as gifts and send them with a stunning beauty box, you can earn Boots points as you buy and you can order online and collect in store if that's more convenient for you. There's also frequent offers and sales available across the Boots beauty range to help you save money on all your essential beauty products. Standard delivery: £3.50 or free if you spend over £45. Usually delivered within 4 working days 8am - 9pm. Next day delivery: Available on orders placed before 7pm. Orders placed after 7pm Mon-Fri or anytime Sat / Sun will not be delivered next day. The earliest delivery date for these orders will be shown at the checkout. Next day delivery is not available on medicines, these are shown with the green pharmacy cross symbol. Usually delivered between 8am-9pm. Click and Collect: Click and collect in store is available from over 2300 Boots stores nationwide. If your order is placed before 8pm, it will be ready for collection after 12pm the next day (next day available if you order Sunday to Friday*). You can return any unwanted items to any Boots store within 35 days of receiving your order for a refund or replacement or return free of charge using the returns label on the invoice received with your order. Unfortunately, Boots aren't able to exchange items. For details on store opening times, telephone numbers and locations, use the Boots store locator. We are constantly on the hunt for first order Discount Codes for Boots to help you with your money saving. Our experts check dozens of sites for secret codes including NHS discounts, student sites & social media channels saving you time & money!